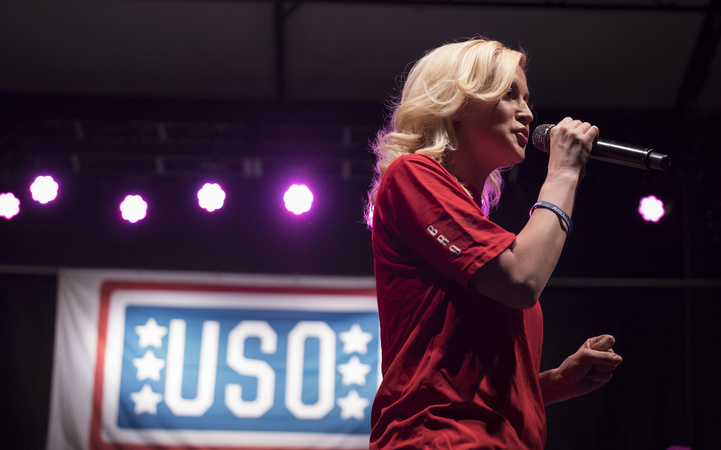 With 11 USO tours under her belt, Kellie Pickler has visited with and performed for quite a few service members and their families – 44,603 to be exact! Pickler has been a strong supporter of the military community and the USO ever since her very first tour to Iraq in 2007. From traveling with the Chairman of the Joint Chiefs of Staff to Skyping with service women stationed overseas on Valentine’s Day, Kellie has proven herself to be a true Force Behind the ForcesSM. Not to mention, she has been honored for her support of the military numerous times having received the Department of Defense Spirit of Hope Award, Chris Kyle Patriot Award and USO of North Carolina’s Heart of the Warrior Award. Click through the photo gallery below to see more from Kellie’s past USO tours. Country recording artist Kellie Pickler performs for the crowd at Fort Riley, Kansas. 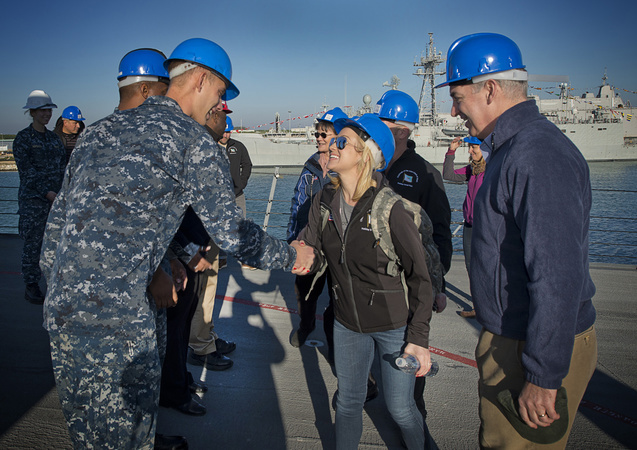 Pickler greets sailors assigned to the USS Ross during the Chairman's USO Holiday Tour in 2014. Pickler poses for a quick selfie taken by Air Force Command Master Sgt. 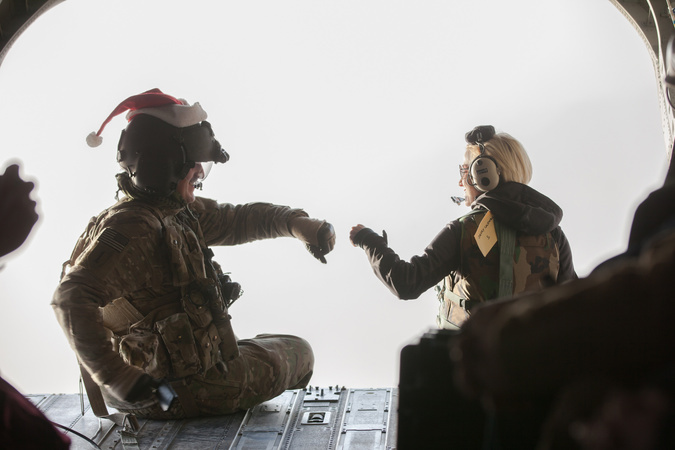 Thomas in front of a CV-22 at RAF Mendenhall in the U.K.
Pickler fist bumps a service member while taking a flight over Afghanistan to another USO tour stop at Forward Operating Base Walton. Pickler "suits up" during a 2012 USO holiday tour stop in Bahrain. Thank Our Men and Women in Uniform by Sharing a Message. Country music artist Kellie Pickler, actress Dianna Agron, actress Meghan Markle, retired Chicago Bear middle linebacker Brian Urlacher, comedian Rob Riggle and Washington Nationals pitcher Doug Fister headed on the 2014 Chairman's USO Holiday Tour. As the world waits in anticipation of the couple's royal wedding on May 19, we've pulled together our four favorite USO and military support moments featuring the British prince and the Suits actress. NFL players Andrew Luck, Dwayne Allen and David DeCastro, Indianapolis Colts head coach Chuck Pagano, musicians Phillip Phillips, Diana DeGarmo and Ace Young, actors Dennis Haysbert and Jason "Wee Man" Acuna and Miss America 2015 Kira Kazantsev are all circling the globe with the admiral to greet and entertain troops and their families as part of the 2015 USO Vice Chairman's tour.